Fresh from my first purchase of a Nakaya fountain pen many months ago, I started trawling through their website. I was looking at all the different models and wondering which I would get if price wasn’t an issue. The Fox with the Harvest Moon definitely caught my eye. I didn’t really care about the type of technique was used, all I really care about was the art on the pen itself. After many months, I finally convinced myself to pull the trigger when I heard that Nakaya was going to raise their prices. That was way back in the January. 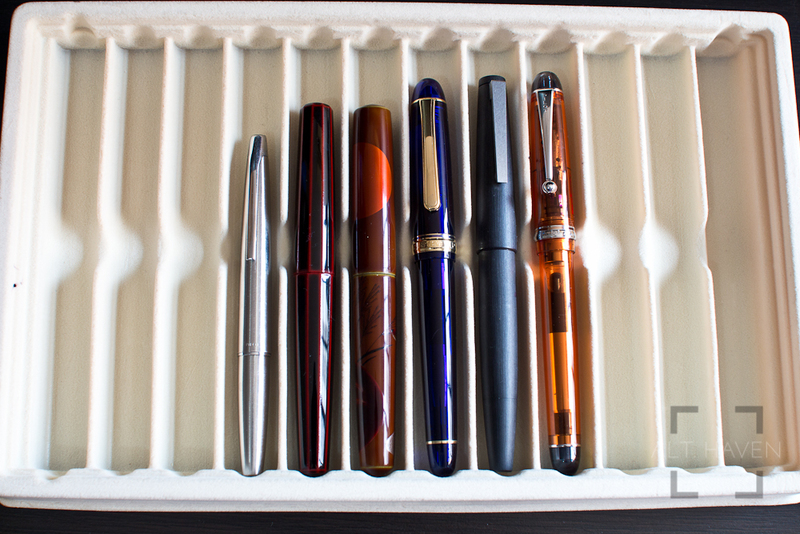 I settled in for a long wait as these pens tend to take. However I was surprised back in April when I received a call to pick up my pen. 4 months must have been some kind of record. I know this isn’t the most affordable pen around. Even among Nakaya fountain pens, this is not on the lower end of things but I must say I don’t regret the purchase one bit. One special note, my Fox with the Harvest Moon isn’t in the standard Cigar shape as shown on the Nakaya page. I had requested to have it done on a Piccolo body instead. I had thought given the amount I had paid for this fountain pen, I might get a bigger box or something to the effect. Alas, it was the same box as my previous Nakaya. The small wooden box pulls open to reveal a red velvet bed where a blue and gold pen kimono rests. Inside the pen kimono is my precious new Nakaya fountain pen. The Piccolo is one of the iconic Nakaya pen shape. Basically, it is a cylindrical barrel with slightly pointed ends. The Piccolo isn’t a long pen. Capped, it is about the same height as a Faber-Castell Loom but once it is uncapped the same height as a Platinum Century 3776. The top and bottom half of the pen is almost the same length but with the cap being the shorter end. The cap unscrews in less than 1.5 revolutions. The grip’s design is very similar to my Nakaya Decapod Mini but it is overall wider and more comfortable on my Piccolo. I love that the grip has a slight tapering effect from the barrel to the nib. It flares out just before the nib to provide a sort of stopper for my fingers to rest on. The threads on the barrel isn’t sharp and it doesn’t hurt to rest my fingers on them. Overall, the Piccolo is a very light and short pen. I wouldn’t be posting this pen anytime soon either so if you have large hands you might have to go for the Piccolo long instead. That’s a pen body shape exclusive to Aesthetic Bay. Without a clip, it is very prone to rolling at the slightest chance, sometimes I think this pen has a death wish. 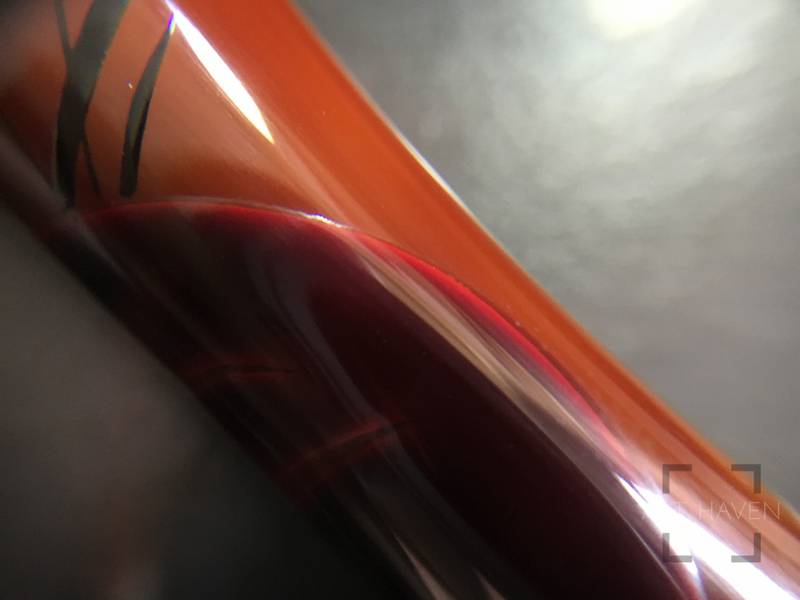 Like all other Nakaya fountain pens, the Piccolo is also a cartridge and converter filler. Both of which are provided in the packaging. My main complaint is the low ink capacity of the converter. That’s easily solved by refilling the cartridge instead. I have had converter seizing up and had to have silicone gel reapplied more than once. I don’t understand why I don’t have such problems with Pilot’s converter while I had with Nakaya’s / Platinum’s. Now that we got the boring stuff out of the way, let’s get to the meaty parts - the art. The Fox with the Harvest Moon starts with a heki-tamenuri base (a two layer urushi finish with being the top layer brown and green as a base layer). Personally I find the photos on the Nakaya page very misleading. Maybe it is the photography or the lighting but the heki-tamenuri base wasn’t obvious. I was so sure it was a dark red base. It was only during a conversation on Twitter where the difference between the photos on Nibs.com and the Nakaya page was pointed out that I realised it was a heki-tamenuri base. Personally I don’t like heki-tamenuri finish in general. However I was told that if I had known about it when I placed the order I would be able to make a request to change the base. Keep that in mind if you order anything similar from Nakaya. If I didn’t realised it before I picked up my pen, I think I would have been in for a shock. I was all prepared to be disappointed with my pen. However I must say the heki-tamenuri finish does work with fox and the moon. The moon is a nice bronze almost orange circle that takes up a large part of the cap. The moon isn’t raised but flat against the cap. The lower half is dominated by the fox. The fox mostly a very deep dark red with a red glow all around it. It has a very white and luxurious belly and tip of its tail. The white shines when it catches the light. Finally, accented with black eye, nose and tips on its ears. Behind the fox are stalks and stalks of what I can only call vegetation because I am a lousy city dweller who cannot identify plants when I look at them. The vegetation was done totally in black. What’s most impressive is the individual seeds on the stalks are all painstakingly drawn. The art on the entire lower half of the pen is raised. You can feel the fox and vegetation when you run your finger over it. Some parts are more raised than others it feels like the fox is in the foreground while the moon is in the background hence the difference in depth. Against the brown base, the fox stands out and the moon more so than the fox. I must say the workmanship was outstanding. To cap it off, there was even a tiny little paw print on the grip section. The art is neither in your face nor is it flashy. It’s a subtle piece of functional art that I really enjoy. Now onto the beating heart of the pen - the nib. I had opted for a soft fine nib since I had a soft medium in the Nakaya Decapod Mini. This is also the first nib I had a nib tuned without being present. My assumption being that as a lefty, we tend to write in a wide variety of angles. The nibmeister might assume I am an underwriter and tune accordingly. In my order form I had made sure to indicate my angle of writing and I think it paid off. The SF nib has the most delicious of feedback as I write. The bounce and give of the gold nib is just tantalising. I’ll not doubt the nibmeister’s ability to deliver a great writing experience again, with or without me. Yes, this is an expensive fountain pen. Yes, you can get a regular Piccolo from Nakaya at a cheaper price. Yes, the art on the pen adds nothing to the writing experience. But it gives me joy to use the pen. Plus, this kind of functional art is portable. I must say between the Nakaya Decapod Mini and this pen, I much prefer this fountain pen. The grip is more comfortable and how can I say no to that handsome fox?